Sometimes the trouble with teaching for 20+ years is the curse of knowledge. I have tried so many different techniques and noticed so many different results that I get to feeling paralyzed by choices! I've also learned that some strategies are great for winning the battle, but losing the war--they work really well in the short term, but leave me with greater challenges in the long term. But last month, I learned that sometimes techniques that I discarded a decade ago are worth a closer look. Enter Star Table. In the research compilation library of my mind, assigning points to different tables as a competition has as many entries in the "Con" column as it does in the "Pro" column. In the short-term, it is highly effective, as groups will quickly learn how to manage their behaviors to earn points. In the long-term, well, are the students really shaping up to improve as learners, or are they just performing to win points? Because of these issues, I really had abandoned table incentive schemes ten years ago. In October, I added a "Star Table" incentive, but it was only for cleaning up under the tables and putting up chairs at the end of the day. For these small chores, I feel that a tangible incentive is both helpful and necessary. Each day I'd assign points to table based on what their desks looked like at the end of the day, and at the end of the week the Star Table got to "spin for dollars" with my wheel of fortune and the classroom economy. It was pretty simple, actually, and got the classroom cleaned up with a minimum of fuss. But Star Tables were on my mind when I rearranged tables for the month of November. 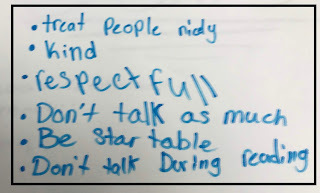 To build a better climate, I started the new groups by having students create group norms for their table. (I picked up this idea from a NASA STEM workshop, and as a teaching tip, is the one of the BEST little tricks I've ever learned.) The idea is that students have a dialogue with each other to dream up what they want for themselves. When issues arise, it's easy for a leader to refer students back to the group norms to address problems. Group norms are also great for finding out what you value as a teacher, because to a degree the norms that students create tend to echo what they hear a lot of in the classroom. (I know this from working with group norms in after school clubs, in which we have a mix of students from different classes.) If the group norms come out anemic or weak, that can be hard to face, because it means that somehow my messaging as a teacher is not coming through. November's norms were an interesting assortment! Notice in this one the students in the group took turns writing the norms, which I hadn't expressly suggested. They also used a nice numbered list format--again, not something that I had directed them to do! 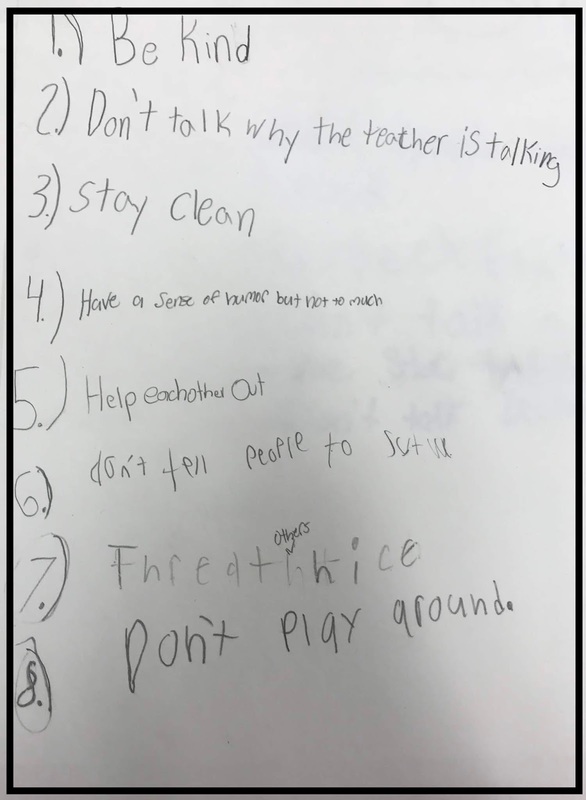 What do these norms say about our classroom? 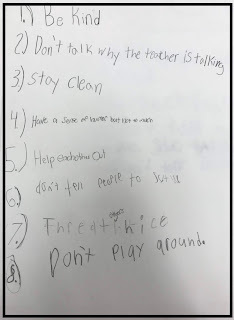 I was really happy to see #1, but I can see the impact of Star Table right there in #3: "Stay clean." I especially love #4: "Have a sense of humor but not to much." In this next set, I really liked that they started with kindness and respect. Once again, though, I could see the influence of Star Table. As I'm writing this, I wonder if maybe I should have backed off from Star Table. However, in the first week of November, I made a different choice. 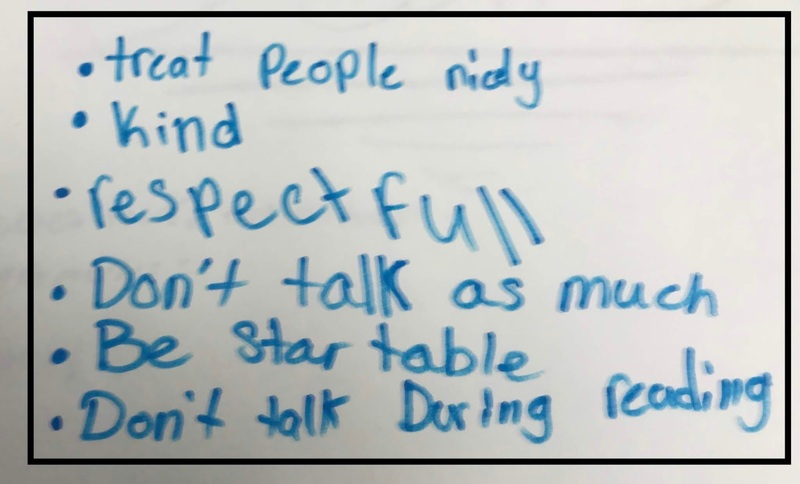 I looked at these norms and realized that my casually implemented Star Table was a powerful force in the classroom. What if I could harness that force to achieve more good? What if I kept points throughout the day, for things beyond cleaning? 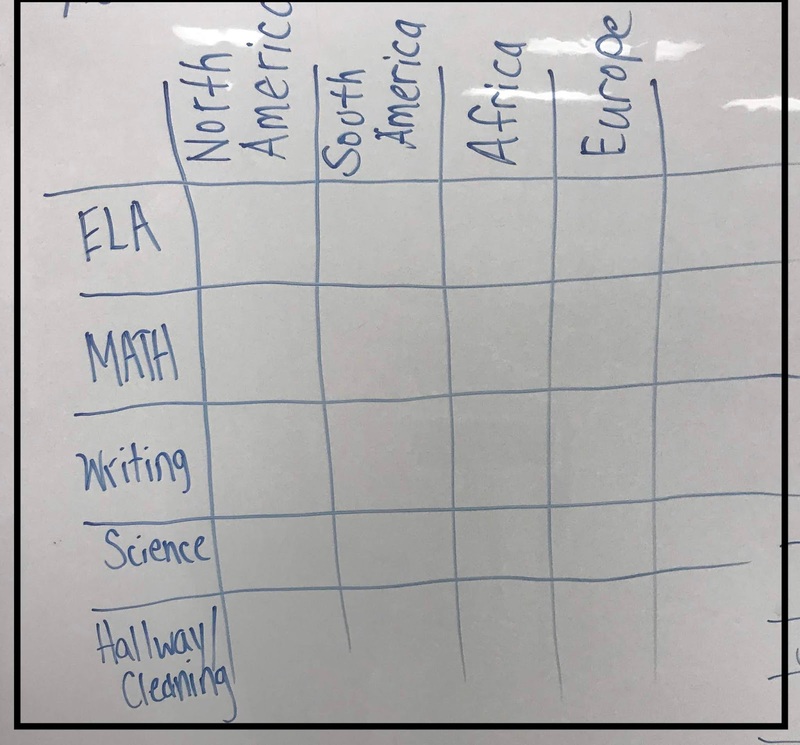 For the rest of November, I created a chart on the dry erase board each day, and put up points for tables throughout various classes. As I recreated the chart every day I could never help but reflect on how this method of management has gone wrong for me in the past. As I wrote the table names each day I berated myself for employing such a meaningless technique. Once I defeated my anxiety each day, I added or subtracted points as issues arose. Because I prefer to be the Generous Benefactor instead of the Evil Deductress, I was often quite generous in the giving of points. 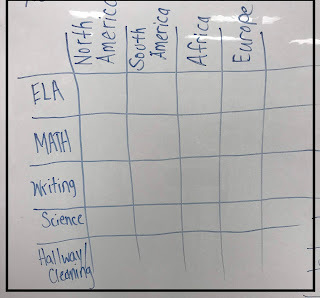 Each table could earn 3 points for every session, and I would add an X or a star in the box as needed. I have to admit, sometimes adding that X felt satisfying, like when it was five minutes into independent reading time and AN ENTIRE TABLE had digressed to a conversation about Fortnite. When there were issues that involved only one student, I addressed them with that one student instead of marking down the whole table. I know from experience that taking points off a table for the behavior of one student is the pathway to ruin! What was different with this year's implementation of Star Tables? First of all, this was the first time that I explicitly linked them to the group norms that students created. Another innovation was to give minutes to our entire class's Preferred Activity Time if all four tables earned all of the points for a class. This helped to provide an incentive to benefit everyone instead of focusing on the competitive aspect. I just finished Week 3, and it was still working harmoniously in the background. Working to the point at which I can just pick up my dry erase marker and frown at the board for a moment to encourage a class to get started! Instead of taking too much time to implement, this method has really allowed me to spend more time working with students and less time giving directions. The curse of knowledge can be a huge obstacle for those of us in our third and fourth decades of teaching. However, by pairing new tricks with old techniques, we can dust off some strategies and make them work again. De-emphasize the competitive aspect to build cooperation in your room. Start with a robust set of group norms to guide how tables will behave. If one table is significantly behind the others, make adjustments to the seating chart. Do not punish the entire group for the misdeeds of one. Instead, let that one student earn points or minutes for the whole class. You will be much happier if you are generous with points. This works best for short periods of time, especially the period of November-January. Eventually every management scheme gets stale! Encourage group members to help each other: "In one minute I'll be checking to see how tables are doing. Does everyone have their ____ and ____ ready to go?" Try random point awards: "I'll be pulling popsicle sticks at random times through that work session. If I pull your name and you're on task, your table will get a point."